Frequently Asked Questions - You ARE an Artist - You ARE an ARTiST! Chalk pastels are a very easy and forgiving medium to work with. Still, chalk pastel artists sometimes have questions. Here is a list of frequently asked questions for our art tutorials. Chalk Pastels: What is the difference? Nana explains the difference between soft, hard and chalk pastels. Plus pastel pencils, pan pastels and more! What are the must have supplies for chalk pastel art? What are the type of chalk pastels that Hodgepodge loves? How do you store chalk pastels? How do you clean them? Q: What age are your video courses and ebooks for? Q: Why does Nana say to sign, date and name your painting? A: Naming every picture is a habit I learned from a teacher years ago who said, if you name your picture, it gives it permanence. A foggy marsh at sunrise can have a name like “Still the Marsh.” A perky chickadee sitting on a limb can be named “Saucy Fellow.”And a sandy beach with brightly colored umbrellas has the name “Beach Destination.” Just take a moment and think. Give your imagination time to work a magical name that tells your painting’s story! Like a true artist, sign at least your first name or initials on your picture. Down in a bottom corner is a good spot. Sometimes we sign our names on the back of a picture. If you share photos of your children’s artwork online you may want to consider having them sign their names on the back of their pictures as well. More on naming and signing pictures. Q: Why does Nana call chalk pastel pictures paintings? 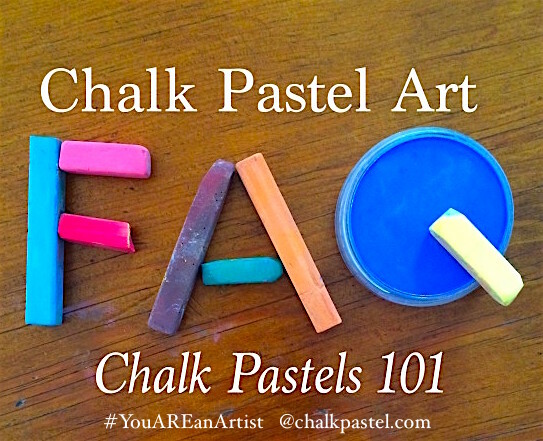 A: Chalk pastel sticks are pure pigment. So it is simply painting in dry form. Q: How can you seal a finished chalk pastel painting so that it does not smudge? A: Get a cheap aerosol hair spray like Aqua Net (not pump hair spray) I recommend taking your painting outside to spray. Just a quick, light coating will do to seal it. Here is a video of Nana showing you just how to apply fixative to a finished chalk pastel painting. Also an option is framing with glass if you would like to share as a gift. A: Christina, Good questions! I know that the chalks we use are non-toxic. I’m fairly certain that all children’s art supplies are required to be that way. I think of the chalk pastels we use as glorified sticks of regular chalk. If you look at (my affiliate link) chalk pastels on Amazon, you will see that they list them as non-toxic.You could look on the side of the package that you are considering purchasing. You can look at a local craft store like Hobby Lobby or Michaels. Also, we wipe our table down with regular wipes after we use the pastels. But you could always use an inexpensive, plastic tablecloth to cover your table if you are concerned. Yes, chalk pastels are what we call ‘blessedly messy’ – meaning that the colors blend very easily, making it both fun for children and adults alike. We do keep the baby wipes right on the table. We also use smocks (some of dad’s old shirts) or wear something we didn’t mind getting stained. Chalk pastels can stain clothing. Now that we are practiced in this art medium, we don’t wear smocks any more. I just wouldn’t suggest your children wear their Sunday best. And yes, pastels can stain carpet. Our kitchen table is over easy to clean linoleum. A: There is a fellow homeschooling family, the Southerlands, who printed A Simple Start in Chalk Pastels and bound the copy so they could flip through and follow the tutorials. They have a color laser printer which made it inexpensive to do. But another answer would be to print the couple of pages of the individual lesson before you use it so that it is easy to flip through with chalky hands. However, you can sit your computer at a slight distance from the chalks and paper, using baby wipes to wipe your fingers before scrolling through the lesson. That’s definitely something we do often! How do you plan simple afternoon art projects? Just getting through a school day can be overwhelming. And here I am sharing about art projects? Well, rest assured I entitled this planning post Simple Afternoon Art Projects for practical purposes. Because I know. I know about trying to be a fun mom and wanting to give my children opportunity to enjoy art. What are some great gifts for chalk artists? How can I inspire my artists? This art box is the answer! How do I add in the joy of art? Since adding in the joy of art is one of my passions, I’m here to encourage you that building this habit is not hard. 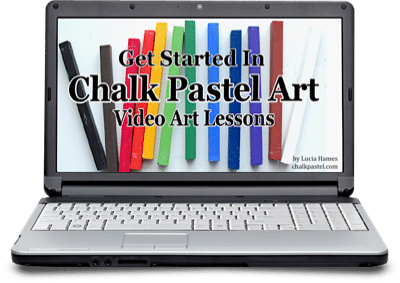 Head over to grab Nana’s free set of Get Started in Chalk Pastel Art video art lessons which includes our Getting Started in Chalk Pastel Art ebook (with coupon for your first purchase). You might also be interested in Nana’s Artist Clubhouse Video Art Lessons sampler and our monthly You ARE an Artist Clubhouse subscription.